Magnolia Dolce is the latest release from i Profumi di Firenze, and features magnolia petals "bathed in Damascus Rose water for 10 days to capture their delectable creaminess". The top notes are sweet and slightly sharp, with possibly some lily of the valley or another, similar floral. It calms to a creamy magnolia with a touch of rose. The dry down is very soft, with just the tiniest hint of powder. I am still guessing here, but I get an impression of iris, and maybe some sandalwood in the base. This is a very pretty, spring-like scent, and by no means overly sweet. I no longer have a sample of the Santa Maria Novella Magnolia to compare, but from what I remember, the Santa Maria Novella is considerably sweeter. This is a more delicate, almost ethereal fragrance, in the manner of Acqua di Parma Iris Nobile, though they smell nothing alike. Magnolia Dolce is available as an Eau de Parfum, and will be exclusive to Barneys through the remainder of 2005. Samples of Magnolia Dolce, or any other iPF fragrance, can be purchased for $1.50 each by sending a check to Isabella Imports. Note: image is Magnolia Flower by goingslo at flickr; some rights reserved. I adore many IdPFs – they are such lovely wearable perfumes. Would love to try this soon. The shop in Florence is a rather lovely – such a down to earth place – no snpbbery at all – most things there are lotions, potions and herbal pills. The fragrances are important but not their main focus from what I have seen from my visits. They also make body lotions up for you with the perfume of your choice from small concentrated perfumes. There are many more perfumes there than what I have seen on any online stores. They are very affordable fragrances – a little over 20 euros – so the US distribitors make a real killing and the Italians know that! I digress but thought you may find this interesting. Hi R – And the lemming keeps swimming. 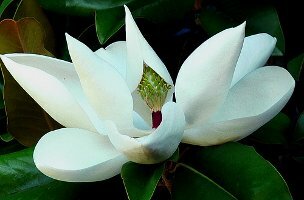 I have been searching for a lovely Magnolia ever since sniffing a flower last spring when the top citrus note, creamy middle and the warmth of the sun and earth made me yearn to capture the scent in a bottle. (I don't remember any powder in my experience) I look forward to trying this and have so far been impressed with the freshness of the IPF. I will let you know what I think once I try. Thank you so much for your review and your generosity. F, the powder is just a whisper, really, barely there at all. Can't wait to hear what you think of the Magnolia Dolce. My memory of “real” magnolia is vague at best, despite the fact that there was a huge magnolia tree right across the street from my last house. love the idea that the magnolia petals were “bathed in Damascus Rose water” … ah, to be bathed in Damascus Rose water! Although I don't think of sweet florals (and you did qualify that sweetness) first for summer, this one seems so appealing! Hey, that does sound lovely! And float a few magnolia petals in my bath too. This really is a light fragrance, I don't think it would be overwhelming for summer at all. Magnolia Dolce is beautiful! It is soft and light, nothing crisp or sharp, it's gentle and fresh and a lovely magnolia. No resemblance to my other magnolia fragrance, L'Instant De Guerlain, which is thicker and more intense. You just get that delicious I Profumi feel on this one. Definitely there is a certain 'something' about the I Profumi line! I would buy this the next time I'm at Barney's! I look forward to trying this one. I have fallen in love with ElizW's Magnolia (excuse me if I repeat myself) and have it in all forms:edp, soap, lotion, bath oil! It is a soft floral with a clean aspect–the tiniest touch of citrus heart and just really, really lovely. I have tried some other ElizW's florals and have not been overly impressed, but this magnolia is different. Oh, but you were talking about IPFs!! Silly me. Yes, as I was saying, I'm going to try this new IPF Magnolia. Off to the salt mines. Happy Monday, tout le monde! P, I agree, it is much more delicate than L'Instant. i Profumi has a very Italian feel to me: fresh & uncomplicated. Glad you got the chance to try it already! L, I will have to look for the Elizabeth W. The few florals I've tried from the line have been very, very sweet. Is the Magnolia soapy, or just clean? A happy Monday to you too!! No, not soapy, just…somehow…clean. And I don't think there's any musk in there, though what the hell do I know, really? I'm still so enjoying my Dammuso, too. I have you to thank for my newest obsession! After coming across this blog, I read your comments about how much you love ElizabethW Magnolia and had to try it. I contacted ElizabethW and they sent me samples of Magnolia, Sweet Tea, Rose and Tuberose! I absolutely LOVE the Magnolia! Sweet Tea is my next favoirte, and Rose is next after that. ElizabethW's customer service is wonderful! Both the Magnolia and the Sweet Tea evoke feelkings of visiting my grandmother in Greenwood, MS in the summers when I was a child. Magnolia is the Mississippi state flower, of course, and my grandmother would make an unrivaled sweet tea with lemon. The Magnolia also reminds me of my wedding, in lateryears, as we married in Southern Illinois amid groves of magnolia trees at a historic mansion, The Magnolia Manor. I was impressed that ElizabethW was so affordable. It is a well-kept secret! So it has been nearly eight months since my last post. For anyone who is interested, I have found a combination of magnolia fragrances/products that work well for me. I have the sample of the Elizabeth W Magnolia and, while I like it, I found a combination, I like better. First, I use the Magnolia body cream (now called the perfumed cream) from l'Ebolario. I layer with it and then I apply the iPF Magnolia Dolce. It is absolute HEAVEN. This combination seems to have more “weight” to it than the Elizabeth W and, to me, seems more mature and refined. l'Erbolario products (especially the Magnolia) are getting harder and harder to find, though. Oh, well, I guess I will have to stock up for a rainy day :-0. They’re really nice, I’m sure they’ll help you!